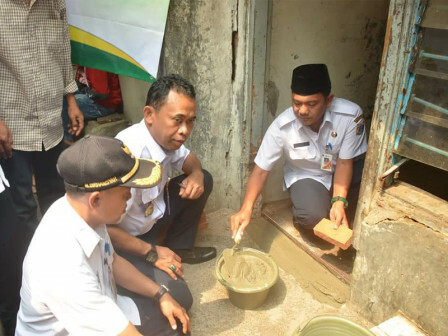 West Jakarta Administrative and People's Welfare Assistant, Yunus Burhan, conducted a groundbreaking for the construction of a dhuafa Bazis bedah rumah 'house renovation' program in RT 014/04 Angke Village, Tambora Sub-district, Wednesday (10/3).
" Thanks to Bazis and the people who care. I am grateful for the gift of all this"
As planned, the 3.5x9-square meter house belongs to Khatimah is renovated totally into two floors. Its construction will take up to two months. "Utilization of citizens is realized by mobilizing PPSU or other forms of care," he expressed, Wednesday (10/3). West Jakarta Bazis Head, Dedi Sentosa explained that bedah rumah is one of the West Jakarta Bazis programs in an effort to improve people's lives. "Totally 11 houses of poor people in Tambora Sub-district will be renovated through Bazis funds," he expressed. Aside that the ZIS funds realization in Tambora last year is worth Rp 924 million. "Bazis also gives ZIS funds aid to the Koran teachers, mosque caretakers, etc," he told. While Khatimah, expressed her gratitude for the Bazis aid over bedah rumah program. "Thanks to Bazis and the people who care. I am grateful for the gift of all this," stated the mother of six childre n.